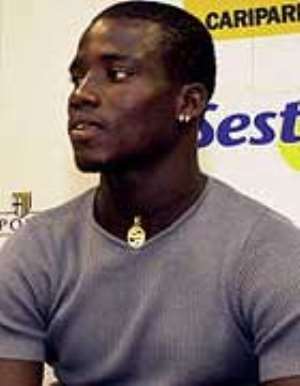 Ghana Black Stars captain Stephen Appiah has said that Uganda has no chance of qualifying for the 2006 World Cup. He said this after Saturday's 2006 World Cup/Africa Cup qualifier between the Cranes and Ghana that ended in a one all draw at Namboole. Appiah told The Monitor that it was going to be very difficult for teams which fail to get maximum points at home to qualify for the World Cup because the group is so tough. "Uganda has got only one point from their last two games including a home game. Their next game against Burkina Faso will be very difficult for them because Burkina Faso are very tough opponents especially at their home. South Africa is also a strong side which will give Uganda all sorts of problems," Appiah said. He also said it will be hard for the Cranes to make the Nations Cup. The Juventus star added that Ghana had got what they wanted from Saturday's game. "For us, we are only aiming at the World Cup and we have no other option. Maybe Uganda can make it to the Nations Cup but it will be very difficult for them as I see things," he said. Appiah said Ghana wants to atone for missing out on this year's Nations Cup in Tunisia. "Uganda contributed to our miss but this time we are a totally different team, organised and focused. We have got the result we wanted in Uganda and we are going to do more damage in Ghana." During the qualifiers for the Nations Cup in Tunisia, the Cranes took four points off the Black Stars. Uganda beat Ghana 1-0 at Namboole and drew 1-1 in Kumasi.